For Brazilian Jiu-Jitsu the most important component of the gear is its uniform called GI. It is an ultra-lightweight garment which is typically a general uniform of all kinds of martial arts. In fact, it is like armor to the body of the fighter. There are several types of GI in the market all of which have various traits to look at. GI’s are made of best comforting and lasting material. There are a couple of points to note before buying a BJJ GI. The points look in the best BJJ GI are the fabric of the GI, the size of the GI, the durability of the GI, the shrinking trait of the GI, and the weight of the GI. 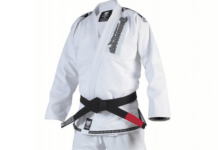 Following are the available Best BJJ GI in the market. Their Gold weave BJJ GI is considered to be the best because of superior durability and amazing feel. Gold BJJ, Jiu Jitsu Gi is outfitted with an eye-popping sugar skull pattern, Inspired by Dia de Los Muertos. This Gi comes with gi pants that are ripstop but at the same time Ultra light and more breathable than traditional cotton gi pants. This Gi is also available on Gold BJJ website. Sanabul is a very renowned company that produces best BJJ products. This GI is one of the latest Sanabul designs which is claimed to be light-weight which means that the fighter will not be burden by the weight of the GI. The fabric of this GI is preshrunk which means the GI will not shrink after its first wash as usually other GI’s do. New fighters usually mistake at this point as they are not aware of this quality. This GI has the anti-microbial and anti-odor quality which makes it one of the best choices in the market. This GI keeps fungal infections and bacteria away after a sweaty fight. Also it is very durable so once it is bought then the fighter does not have to worry about buying another GI for a long time. One good thing about Sanabul Essential V.2 GI is that it is cheap in price. This GI is made of cotton pearl weave that has the trait of extreme light-weight. It is comfortable and breathable so the fighter will be at ease while fighting and training. The pearl weaved fabric makes this GI very durable and last longing. This GI is also preshrunk, so the person owning this GI does not have to worry about shrinking problem. One of the most sold GI on the market. 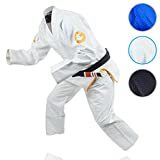 It is not very light-weighted but it is not problematic as the cotton blend in the fabric is very comfortable that makes it very easy to move while fighting. This is a very durable GI and is claimed to last longer than any other GI. The fabric of this GI is cotton made. The price of this GI is a bit more expensive than the others. The Tatami Zero G V3 GI is one of the lightest GI in the world. It is specially made for professional athletes as it is one the best GIs in terms of durability. It is made of pearl weaved material. This GI also has the trait of anti-moisturizing effect so it does it get all sweating while fighting or training. This GI does not lack behind in terms of style and affordability, it has everything to offer for a complete GI gear. 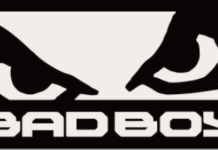 Hayabusa is a very well-known BJJ product producing company with very remarkable gear components. The Hayabusa Shinju 3.0 is as tough as it comes and it very light-weighted. It is very durable and it is designed to last long. The fabric of this GI is pearl weaved cotton which makes is really comfortable and easy to move in. 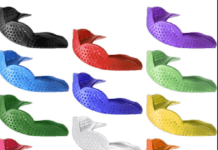 It is available in multiple colors and is fairly affordable. The Gi wasn’t invented for Brazilian Jiu-Jitsu. It was, instead, invented for a highly related martial art that is considered as the main ancestor of BJJ. This is the martial art of Judo. The story goes that the founder of this martial art, Jigoro Kano. Thought of the idea of providing his students with a unique piece of clothing. This was all the way back in the 1800s. He made the link between the facts that Judo’s techniques require grabbing and that the human skin isn’t exactly highly grabbable. Also, regular clothes tend to tear themselves apart under the devastating pulling and pushing pressure that can be developed by a Judo practitioner over them. So, Jigoro Kano created the first prototype of the Gi as we know it today. He was heavily inspired by the Japanese traditional clothing – the kimono. The first version of the Gi for Judo had longer sleeves at the legs and arms and was a bit baggier. Also, Jigoro Kano used heavy materials for the purpose of resisting the aforementioned pressure that the practitioners apply on the garments. And this is how the original Gi was created. After a while, the martial art of Judo was taught by Mitsuo Maeda to some Brazilian students – the most important of them being the Gracies. They, in turn, started the early process of development of what is known today as the martial art of Brazilian Jiu-Jitsu. The Gi underwent some changes. It became a lot slimmer and tight around the limbs. This is the version of the BJJ Gi as we know it today. BJJ schools follow the code set by the earliest practitioners of this martial art. And one of the most important elements of the code is that the practitioners have to wear a Bjj Gi. This is the uniform, so to speak, of all the BJJ practitioners. But the Gi isn’t only specific to the world of Brazilian Jiu-Jitsu. The practitioners of many other martial arts and sports also use it. 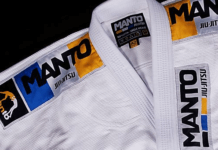 Below you will find out some more information about the history and other interesting facts about BJJ’s garment – the Gi. As you may know, capitalism has its good sides and bad sides. The good side is that if there is demand – there is supply. The explosion of the popularity of martial arts such as Judo and BJJ had a dramatic influence on the market. Many companies started creating and selling Gis. This means that you won’t find it a hard task to buy a Gi that you can use for BJJ practice and tournaments. However, the bad side of capitalism is that you can’t always trust the suppliers. They may try to swindle you out of your money while selling you a subpar product. In all cases, not all BJJ Gis are created of equal quality. Some can be torn by just pulling on them for a while at the weak areas. Others are all but bulletproof and will serve you for years without ever tearing. The main advice that we can give you is that the price is one of the best advisors when it comes to the quality of the Gi. The higher the price – the better the quality, though this is not always the case. You may want to look for brand names as well. Venum, Keiko, Atama, and many other companies are known for the quality of their gear. Finally, you can ask some of the more knowledgeable practitioners on where to get a quality Gi. Your instructor will usually be able to tell you where you can get one such Gi. Just be careful, as some instructors are known to swindle their students by selling them low-quality Gis for high prices. In the end, your best bet is to learn more about the process of determining the quality of clothing – including the Gi. If you know this, then you’re much less likely to make a mistake. 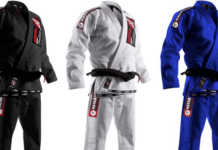 The factors in choosing your BJJ gi is one of the most crucial aspects of your practices, especially if you are going for competitions or tournaments. 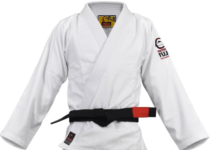 You would need gi that is durable, easy to work in and is approved by the competition authorities since most people are not aware that they are a thing when it comes to the competitive scene. Selecting your BJJ gi without any research is like going into battle without a weapon but we can solve this issue by looking into some things that can determine what BJJ is best for you. Given below are the factors that you should consider when purchasing the best BJJ Gi. The first thing that you would need to consider is your budget, the more money you have, the higher the quality of the gi you will be getting. BJJ gi can cost about $50 to $300 or more, it all comes down to the material used in their making and the brand that puts it out. Other factors include the thickness of the collars, design and sometimes the colors but material plays a huge role here. The gis that is marketed as being made from Hemp or Brazilian Cotton go for more than your usual gis, similarly, the gis that comes from other places like Pakistan cost less. The brand can also influence the cost of the gi because they have been in the business for long and have made a big name for themselves amongst the BJJ community, these are also called specialty brands and their products are costly but the quality they have is amongst the best. 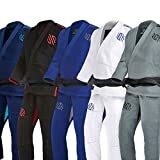 If you are unable to get a BJJ gi then you can opt to go for Judo Gi as they are cheaper; make sure that the selection you make is IBJJF approve so that you can compete in it. One of the least expensive weave but it is great for hot weather as it is pretty lightweight. However, it is not very durable as it has only 300 to 550 gsm and your opponents can grab a hold of it easier. A double weave is simply two single weaves combined, thereby making it more durable and denser. 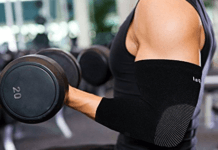 This will also prevent the opponents from latching onto it easily but the downside to it is that it retains heat, especially rough on the skin in hot weather, and is heavier which impacts mobility. Knowing the size of your gi is as much important as knowing the material since it is also one of the major factors that the authorities look into for competitions, if the gi you have on does not fit the size description then you can’t participate in the competition. It is also worth mentioning that the gis shrinks down to 10% in size after you wash them, so select one that is not too tight when you initially wear it otherwise it will be too tight, add discomfort and possible restrict your movement. Each company has a size chart for their own gis and reading it can be confusing as they use an alphanumeric system but it becomes clear when you know what the alphabets and numbers stand for. The letters A, F, and M represent Adult, Female and Children respectively, the numbers range from 0 to 6. There are also size variations including S, H, L, XL which represent Short, Husky, Long and Extra Long respectively. The collar and sleeves are another things to consider since they can impact your performance when you are sparring or training. The sleeves of your gi should not hang loose since it can get in the way if you extend your limbs leading to some sort of entanglement. When it comes to the collar, then there is some gis that has a thicker one and a thinner one; a thicker collar makes it harder for your opponent to submit you with a collar choke while the thinner collars are more comfortable to wear and allow for easier rolling. There are also two materials make up the collar of the gi, most gis is made up of cotton while some are filled with rubber. The advantage of the rubber filling is that they are faster to dry and reduce the growth of mold on the gi. 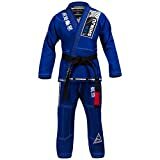 If you are planning on purchasing a gi that you want to use for tournaments, then you would need one that is approved by the IBJJF. There are a set of rules that the gi needs to abide by if you are to use it competitively; it is done so that everyone can be on equal ground and not have any sort of advantage. 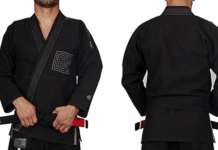 One of the rules is the color, you cannot have a gi that has a different color other than white, black or royal blue and also the collar should not have a contrasting color. The fabric that the gi should be made of is cotton or a cotton hybrid weave, it should not be too think to prevent your opponent from gripping it, the sleeve should be wide enough to allow 4 fingers to be slipped easily, must reach the wrist and should be 5 cm away from it when you stretch out your arms while the trousers should reach the ankles. An exception for the material comes for juvenile adult and masters categories where the gi jackets should be made out of a woven fabric, the trousers either out of cotton twill or a ripstop fabric and the collars either with EVA or another rubber fabric.